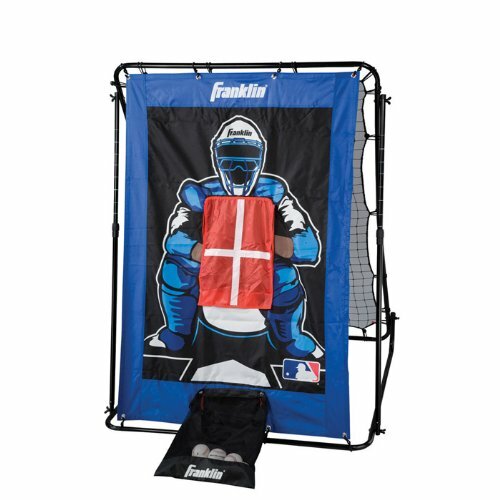 Franklin Sport MLB 3-Way Pitch Return 55" is perfect for improving your throwing and fielding skills. 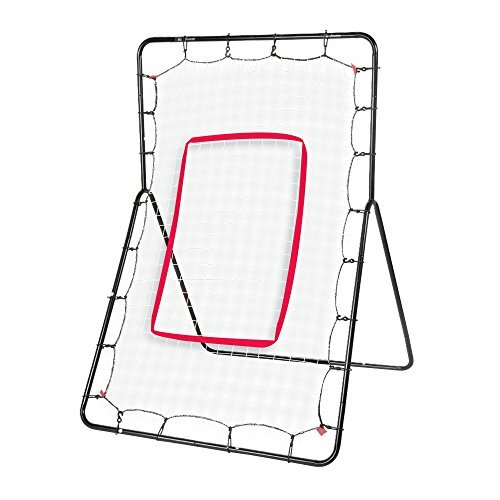 Features 3/4" steel tubing, all weather steel construction and a 24-ply PE net with target ribbon. Size: 55" X 36". 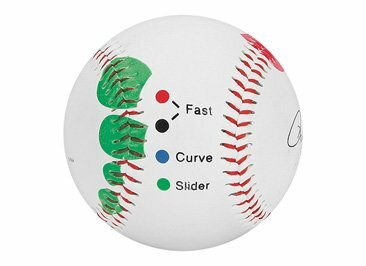 Insider Bat Baseball Pitching Trainer with Color-Coded circles for proper finger placement to learn each pitch. Training Ball can be used by Lefties and Right Handed pitchers. 9" official size and weighted ball. Insider Bat Baseball Pitching Trainer with Color-Coded circles for proper finger placement to learn each pitch. Includes Instructional booklet with detail information and photos showing the proper grip and throw for each pitch. Training Ball can be used by Lefties and Right Handed pitchers. 9 official size and weighted ball. Great for Baseball Coaches, Parents & Great Christmas & Birthday Gift for that Softball Pitcher. The Franklin Sports MLB Adjustable Deluxe Baseball Pitch Return Trainer features 1.25" tubular steel construction with baked enamel finish. The simple two step fold up design allows you to fold up this return trainer with ease. Designed to improve batting skills and hand-eye coordination by using a smaller bat and smaller bat barrel. 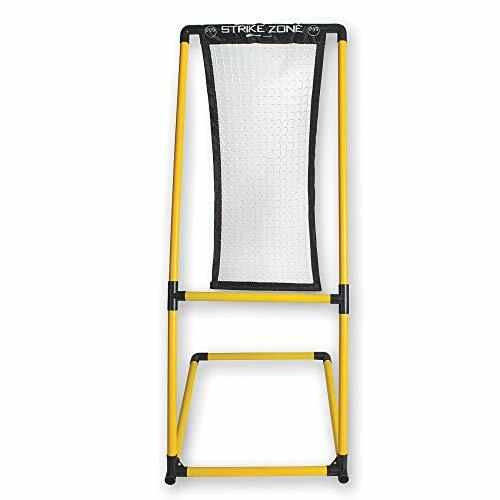 Increase the lifespan of your batting cage net with this sleek black vinyl backstop featuring bright yellow webbed edging and high visibility yellow 28"Hx 17"W strike zone target with white catcher image. Durable brass grommets at the top for hanging and bottom grommets to loosely secure the bottom in windy conditions. Ideal for Baseball, Little League or Softball. Simply hang to the top of your batting cage frame. Not only will you lengthen the lifespan of your batting cage net, it will give you the target practice you need and want. Don't have a batting cage? Hang this backstop from a tree, or any creative structure you might make from scraps around the garage or house. Eliminate arguments over balls and strikes with our exclusive pitch target. Perfect for fast and slow pitch WiffleA,A ball games. 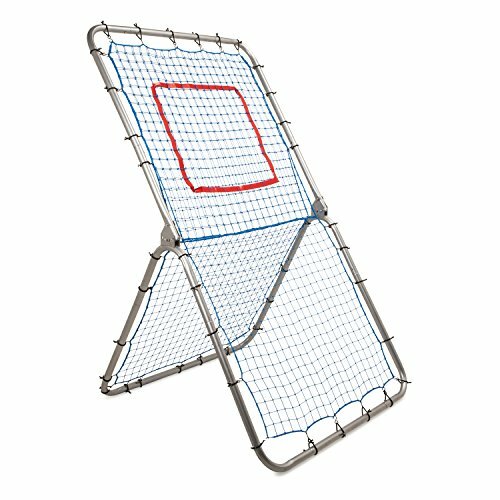 The quick to set up target is 37" H and has a 17" W x 30" H strike zone. For a larger strike zone, count pitches that hit the yellow part of the frame as well as those that go through as a strike. \nWarning: This target should only be used with lightweight, hollow plastic baseball and softballs and is not intended for use with any solid baseballs or softballs. 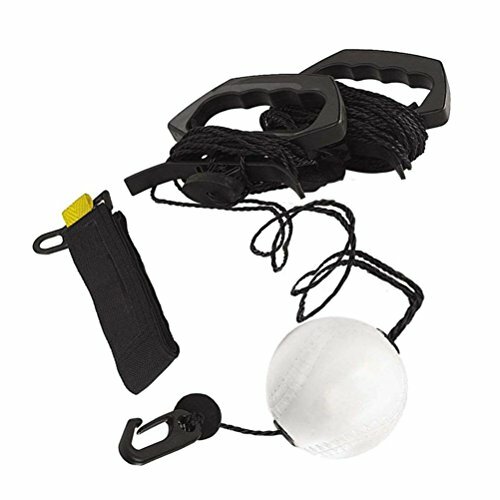 Franklin Sports 2-in-1 Switch-Hitter 65 features a multi-position ball return trainer on one side, with a pitch trainer target and ball-collection system on the second side. Pitch target and return trainer all-in-one! Flip style SWITCH-HITTER pitch target adjusts for right or left handed players. Size: 68 x 44 . Manufactured by Start Right Sports: . GREAT FOR HOME PRACTICE: Sets up in seconds and folds back up in seconds for storage. TEAM PRACTICE: working pitchers and catchers while the rest of the team has the field. GAME TIME: pre-game warmup and bull pen while the game is in progress. TRAINING: teaches pitchers to step toward the plate w/ the narrower landing area of 24". Platform is wide enough to start the pitching motion when pitching from the wind up. LESSONS: can accommodate adult's weight when demonstrating correct pitching techniques. Specs: Weight: approximately 44 pounds total. Wind up section is approx. 18 pounds, slope section is approx. 26 pounds. Height: Regulation 6 inches high to the top of the platform. Slope: Regulation 1 in. drop for every 1 ft. length. Length: 5'6" from pitching plate to end of mound. Total Length: 7 ft. Two piece construction for easy transport in a car, SUV or truck. Secures together with latches and will not come apart when in use but are simple to unhook when transporting. No Inconvenient Bolting and Unbolting to transport mound. Comes w/handles and latches serve a dual role to connect the hinged slope section together so it doesn't open up when transporting. Covering is heavy duty, double backed astroturf. Sanded edges to avoid splinters. All pocket screw construction for solid long lasting life and finished look. 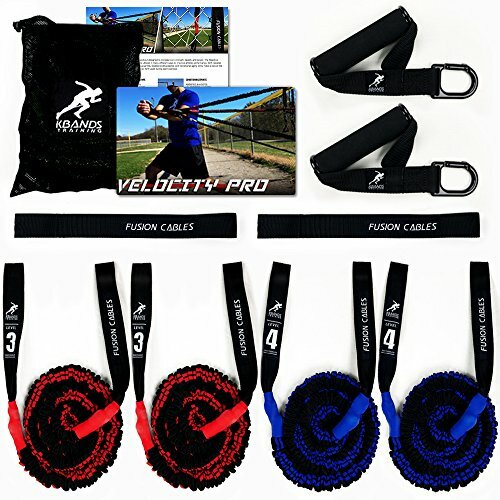 The Fusion Cables Velocity Trainer is an essential training tool for all throwing athletes. With your Fusion Cables Velocity Trainer Arm Bands you will build stability, power in your hips, and explosiveness all leading to increased velocity. With our unique design you are not going to be training from a centralized anchor. You will maximize your results with our Four-Point Mounting System. Each Fusion Cables Velocity Trainer includes four levels of Fusion Cables to maximize arm strength and rotational power. Customizing your Fusion Velocity Cable System is easy. Whether you are a user that is 13 years or younger, or a more advanced user, 14 and up, you are going to receive different levels of Fusion Cables to build strength in your shoulder. Use Kbands Fusion Velocity Cables before you throw to increase blood flow and strengthen your throwing arm. -Hey, coach, your pitching is too slow! -Oh, bad guy, it was hard on my back whenever bend over to get a ball out of a bucket. 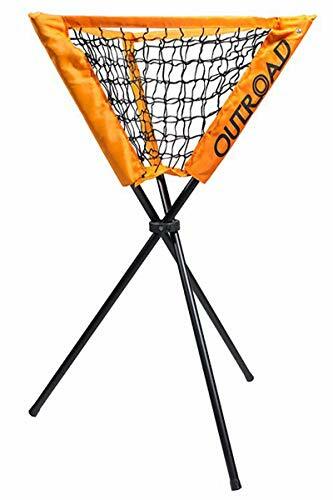 -So why not buy an OUTROAD Ball Caddy Baseball Softball Practice Ball Caddy. Removable Ball Caddy for Batting Practice is light weight and portable with large capacity. Above all, it stands 33.5 inches high that satisfies your bend. -Wow, I will buy it for God's sake! 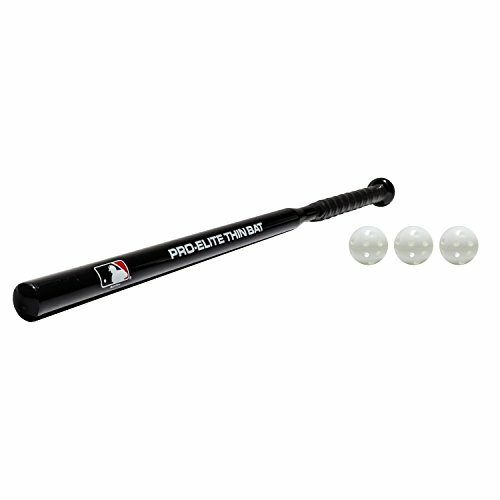 For professional athletes and newcomers to the game alike, the Franklin Sports MLB Pro Return Trainer allows players to work on their pitching and fielding skills with one simple tool. 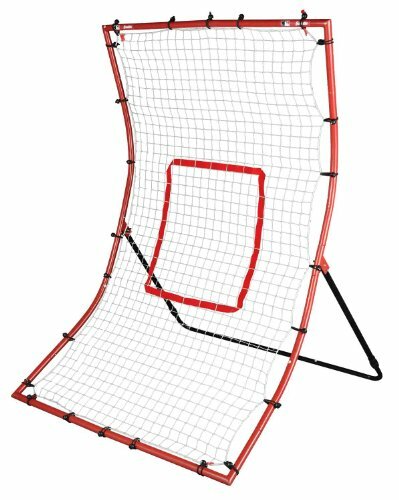 The frame is crafted from all-weather tube steel and comes with locking pins that allow you to adjust the angle of the unit, allowing for a variety of return angles, letting you practice catching grounders, pop-ups, and line-drives. The netting is made from 30-ply all-weather plastic with bungee attachments for added elasticity. Choose a Pro or Junior Deluxe model (subject to availability). In 1946, brothers Irving and Sydney Franklin founded Franklin Sports in Brockton, MA. As the company grew, Franklin's headquarters moved to a larger facility in Stoughton, MA. What began as a business specializing in manufacturing leather sporting good items for the youth market has expanded successfully with the addition of distribution partners in Europe, Japan, Australia, Mexico, and Canada. As proof of Franklin's top-quality products, the Franklin batting glove is the official batting glove of Major League Baseball. From professional athletes to the youngest novices, Franklin meets the needs of all, with innovative products and exceptional value. For over 60 years Doty and Sons has offered quality concrete products. You will get years of use from top quality, reliable concrete site furnishings. All concrete products are made with the finest available materials and modern manufacturing techniques. Doty and Sons values its reputation as the manufacturer of new, superior quality concrete products. With constant updates to product line, their company is always ready to meet even the most custom demands. Doty and Sons is also mindful of the environment, offering products that are made of recycled materials and are virtually maintenance free. Choose from the available sizes. 1.75-in. steel frame construction. Adjusts for use from multiple angles. 30-ply all-weather PE net with strike-zone ribbon. The following items are included in this set----The Original Ernie Parker's Wrist Snapper----Ernie Parker developed The Wrist Snapper training device to teach his students the importance of a proper wrist snap at the pitching release point and to help strengthen the wrist and forearm. This training tool focuses specifically on that part of the release which can present some frustrating problems for the fastpitch player, the snap. This product addresses the problems of weak and incorrect snaps for both underhand and overhand pitching or throwing. The device is great for other sports such as baseball or tennis where a strong wrist snap can help to produce additional power and movement. When the wrist snap is performed properly, the device produces a distinct sound that is both heard and felt, providing instant feedback. If the wrist snap has a twisting motion or is not snapped hard enough, no distinctive sound is produced. With this tool, the player gets both positive and negative feedback instantly. During the process of shaping the snap correctly and receiving positive feedback, muscle-memory builds and strength builds as well. All of these come together to improved the shape and strength of the wrist snap. *****Spin Right Spinner----The Spinner is a softball training aid designed to teach the pitching spins and rotation directions in fastpitch softball. Whether you are working on the basics of releasing the softball or the advanced spins of the rise, curve or drop, the Spin Right Fastpitch Spinner is an essential tool to have in your arsenal. *****The Power Pod---The Power Pod is a great way for players of all levels to maximize the power behind their pitches or their swings. Place the flat bottom of the rubber pod on the diamond or gym flooring, underneath your back foot during training. By pushing your lower body forward, it teaches you to transfer your momentum through the lower body, into your swing or throw. 3 Fastpitch Softball Training Aids ~ Bundle Set! This Softball Pitching Training Bundled Set includes everything you need to start your training! The Varsity Radar Pitching Trainer combines a pitching target with an electronic umpire and built in pitch speed display for the ultimate pitching experience. 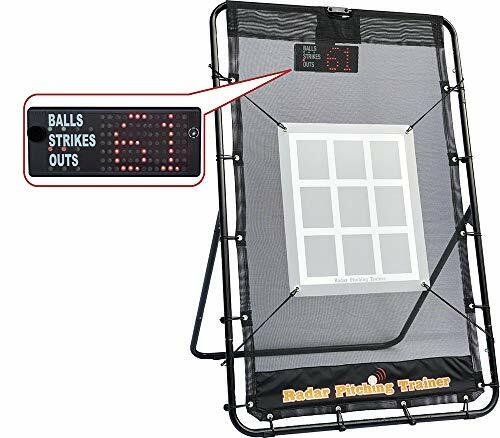 Keep track of pitching statistics - PITCH COUNT, STRIKE OUTS, WALKS - with the trainer's large, Electronic Umpire display. Use instant feedback to build healthy competition, motivate your players, and measure performance. 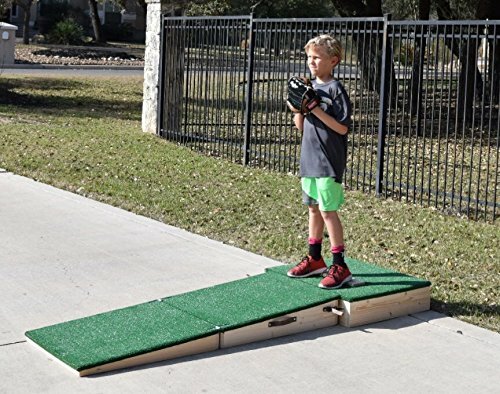 The Varsity Radar Pitching Trainer is designed for youth baseball and softball and is perfect for backyard training, pre-season workouts, bull pen sessions, and fundraising. Calculates pitcher's release speed speed from 25 to 70 mph (baseball) and 25 to 50 mph (fast pitch softball). Speed display can also be turned off. Virtual electronic umpire calls balls, strikes, outs, and walks (simulates a half inning). Software automatically records: total pitch count, cumulative strikes, balls, outs and walks. 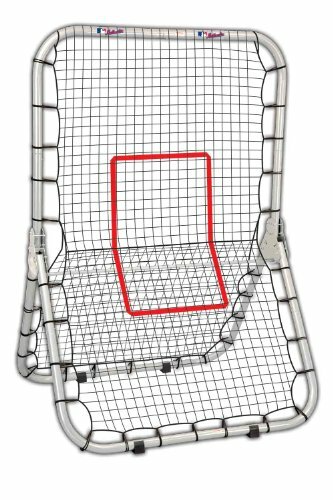 Heavy duty 18 gauge steel frame designed for pitching up to 70 MPH (baseball) and 50 MPH (softball). 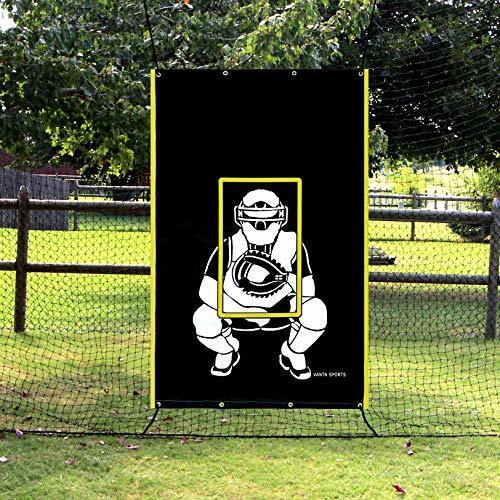 Brand: Radar Pitching Trainer | Manufacturer: J-Biz, Ltd.
Sturdy: The Baseball practice net is constructed of sturdy glass fiber frame and polyester net, which allow taking hardest shots and ensure the practice net long-time usage. 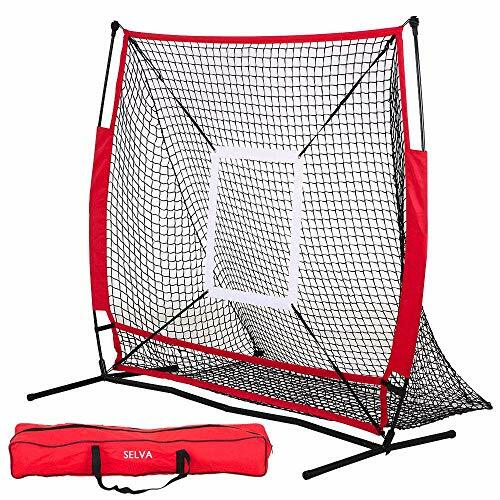 Portable: Lightweight for easy portability and placement, baseball practice net comes with one carrying bag for carrying and storing, which is space-saving and allows it to be easily transported between the home and playing fields. Dimension: 152 x 110 x 152 cm / 59.8 x 43.3 x 59.8'' (LxWxH). 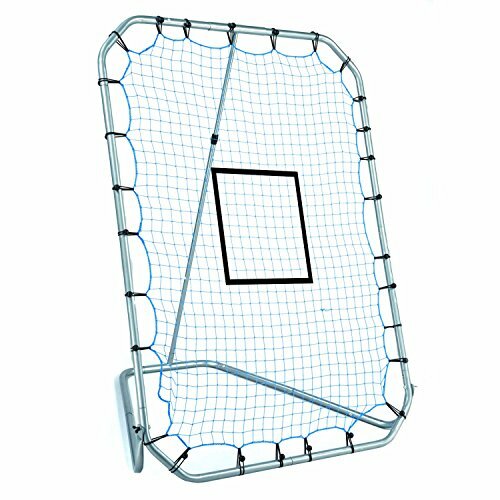 Easy To Assemble: Baseball practice net is very easy to put up and take apart, and the instruction provide you specific pointing, you won't be troubled by assembly methods. SATISFACTION GUARANTEES!